Rashid Khan has achieved most of what a cricketer of his age would have possibly imagined. Born in 1998 in Nangarhar, the Afghanistan leg-spinner made his ODI debut in 2015 against Zimbabwe. Rashid soon got a chance to feature in a T20I against Bangladesh on October 1, 2016. Since then, the 20-year-old is winning games single-handedly for his country. He is one of the few bowlers who is dominating batsmen, in an era of bat dominating ball. Let's have a quick look on his incredible journey thus far. Before Afghanistan and Ireland gained Test status, the youngster only got the opportunity to feature against Associate nations. Most of his games were against Ireland where he threatened every batsman with his magical bowling. The leg-spinner enjoyed a flying start to his career and within no time gained worldwide popularity. The 20-year-old wrist-spinner is a beast in the limited-overs formats. While playing for his nation, the Afghanistan stalwart has scalped 123 wickets in his ODI career at an incredible economy-rate of 3.91. He has 75 wickets under his belt in 38 T20I matches at a magnificent economy-rate of 6.02. His bowling averages of 15 in ODIs and 11.56 in T20Is make him an extraordinary player. The sensational leg-spinner has dismantled every opposition batsmen with his consistent line and length. His variations have outwitted almost every batsman he faced. His batting average of 23.7 in ODIs indicates his improving skills as an allrounder too. Rashid's career scaled new heights when he got a golden opportunity to showcase his talent in the Indian Premier League. It was Sunrisers Hyderabad who saw the potential of the rising star. The franchise included the leg-spinner in their squad at a mind-boggling price of INR 4 crores. 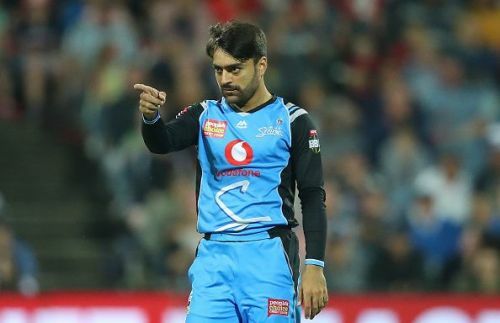 IPL has groomed the career of many young talents, and it was soon the time of Rashid Khan. The wrist-spinner grabbed two wickets in his very first match. Thus far, he has scalped a total of 38 wickets in 31 matches at a splendid average of 21.47. His economy-rate of 6.69 proves his dominance in the cash-rich league. Two years of IPL has spread his potential across the globe. Rashid is currently the top ranked T20I bowler in the ICC rankings with 780 rating points. The star cricketer holds the record of being the youngest player ever to captain a country. At the age of 19 years and 165 days, the stalwart achieved this feat. The first player to take a five-wicket haul in just two overs in a T20I match is none other than Rashid. He achieved this feat against Ireland with his electrifying spell of 5 for 3. The sharp leg-spinner is also the youngest cricketer ever to win the ICC Associate Player of the Year Award. Rashid Khan and records is a never-ending story. As he gradually enters his prime, the Afghanistan star is all set to take the cricketing world by storm in the coming years. Rashid Khan: The Supreme Talent, A 19-year-old Wonder Kid.